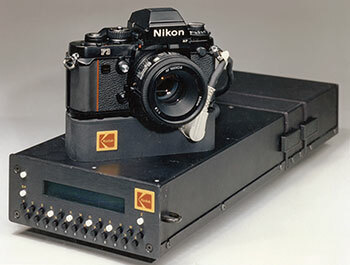 Kodak DCS camera with its Digital Storage Unit (DSU). 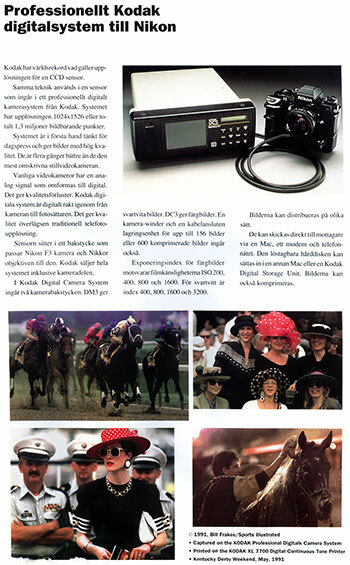 Kodak DCS in Swedish "Kodak proffsinfo" number 1, 1991. Sample photos by Sports Illustrated photographer Bill Frakes. 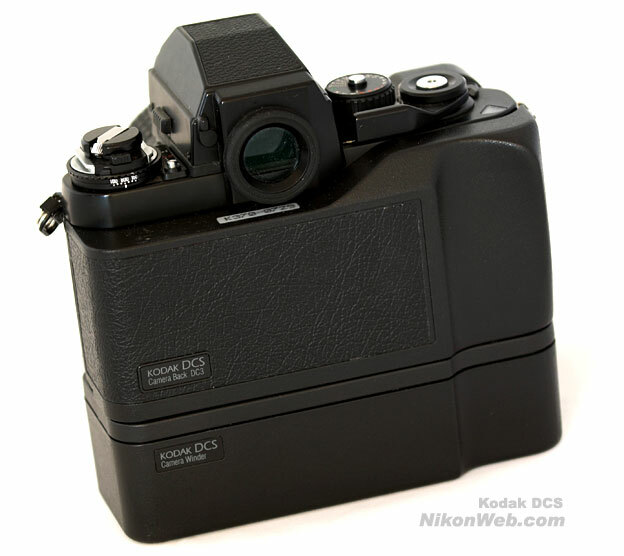 The 1.3 megapixel Nikon F3 based Kodak DCS (Digital Camera System) was announced by Kodak in 1991. The camera consists of an unmodified F3 HP camera body attached to a custom made winder and a digital back. 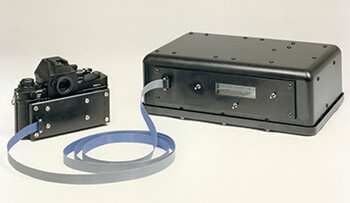 Captured photos are stored on a separate digital storage unit (DSU) that connects to the camera winder via an interconnect cable. The slogan "Convert to a new digital system without switching cameras" suggested that the familiar F3 camera body would make the digital transition simple and easy! To make the system easily luggable for the planet-roving photojournalist, a custom nylon hip pack and an enormous hard case were thrown in for free. Six models were priced from $20,000 to $25,000. A total of 987 units were sold from 1991 to 1994. The original DCS cameras are much harder to find than later Kodak DCS models. I was fortunate to find a near mint condition DCS kit in July 2005. Prices have been steadily increasing ever since. My own DCS kit seems to work ok, but despite some serious attempts, I have never been able to transfer any photos from the Digital Storage Unit to a PC. My attempts are documented in this NikonWeb.com forum thread. According to AP editorial imaging product manager Jim Gerberich, they did even better at the Republican Party Convention a month later. These experiences convinced AP that digital "was now just a matter of when, not if". Later, AP cooperated with Kodak to make the NC2000/NC2000e "press camera". Jim McGarvey, Kodak's lead engineer for DSLR cameras. Photo by jemcgarvey.com. Used with permission. 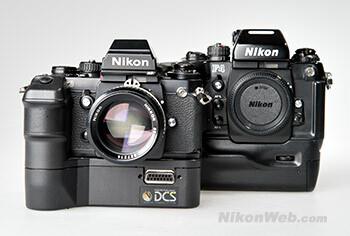 F3 based Kodak DCS (1991) and Nikon F4 (1988). Kodak DCS next to the Associated Press model NC2000e (1996). Nikon D1 (1999) revolutionized the DSLR market. Q: The Electro-Optic Camera - the World's first DSLR - was designed and constructed for a US government client. The customer preferred Canon cameras, so you built it around a Canon F-1 body. Later, when you decided to make your first commercial model, you used a Nikon F3 body instead. Why? A: Nikon and Canon were close competitors and either was a viable choice for a professional digital camera. The Canon preference was specific to that first customer, but the US Gov't. 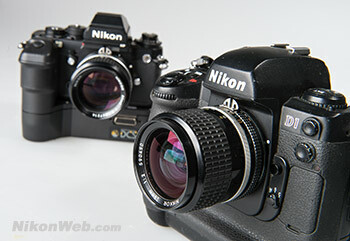 customers more often preferred Nikon, so we used the F3 body on the Hawkeye II cameras, before the DCS. For the DCS, the choice was also simple, as newspaper photographers were the expected prime market and Nikon held a solid lead there, at least in the US. I believe we thought that Canon might have a slight edge in Europe, but we expected to sell more systems in the US initially. 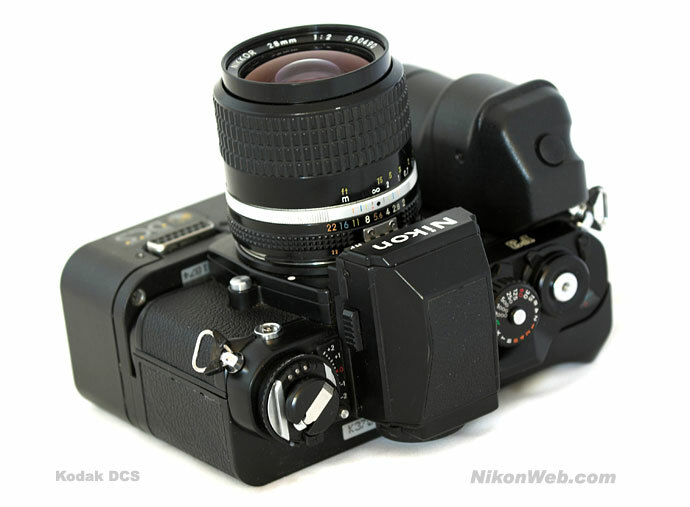 Q: Nikon released their new top of the line F4 camera in 1988. Why did you decide to use the older F3 body? A: We must have considered the F4, but I can't remember the discussions at all. Given the shape of the F4, we probably chose the F3 because it was easier to fit our parts around it mechanically. 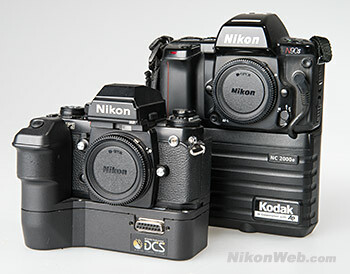 Q: Did you in any way cooperate with Nikon on the development of the Kodak DCS? Was Nikon even aware of your project? A: No and no. I believe they were surprised when we announced the DCS. We bought F3's through normal dealers (I don't remember who), and since the quantity was small before the product launch, I doubt if Nikon was alerted to anything ahead of time. 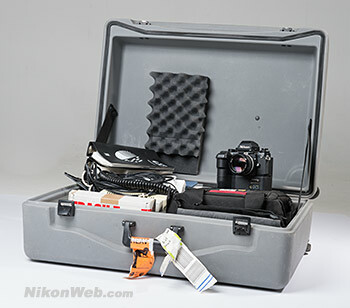 I remember that we were packing the F3 back door in the kit with the DCS, since we had it and a user might want to use the body with film at some point. Nikon told us we couldn't do that as we were not an authorized dealer. We could incorporate the F3 in our product, of course, but not "resell" cameras! Generally, though, I believe Nikon was happy with the situation, since they were selling F3's and the first commercial digital camera was carrying their lens mount. I don't remember any complaint other than the door issue. I don't think we told Nikon ahead of the DCS 200 launch, either, but they did help us with the following cameras. I visited Nikon in Tokyo in July of 1992 - that was the first technical meeting where they shared information on the N90 body that we used on the NC2000 and DCS4XX cameras. 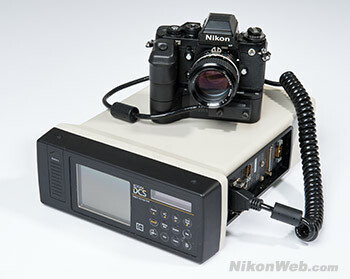 Those models still used unmodified Nikons, and it wasn't until the DCS620 that Nikon modified bodies for us. So it was a slow start relationship. 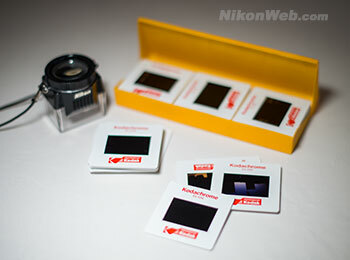 Q: Within Kodak, was Nikon considered a rival at the time? A: I don't think we thought that in 1991, though we did expect that Nikon would eventually be in the DSLR business and we were careful not to disclose too much information, particularly around sensor development and image processing. I don't remember if we had any early warning of the E2, but that didn't impact our business very much. The D1 certainly did! 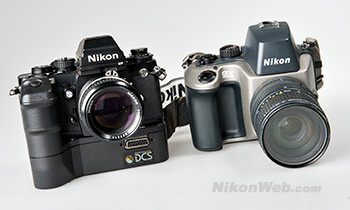 Q: Did you ever look at the early Still Video cameras from Nikon and Canon, both released a few years before the DCS? Any thoughts on the early filmless cameras coming out of Japan? A: We definitely looked at all the still video products. Kodak had it's own line, of course, though we never actually marketed our still video camera. The Mavica line was the closest thing to competition with the DCS, but the image quality was not comparable. It was very clear to us that digital cameras must be computer oriented, not video (or TV) oriented as was everything coming from Japan at the time. I think that computer focus helped us secure the leadership in the business that early. The computer connection was essential for manipulation, storage and transmission of pictures, and of course, the key to unlimited image resolution. Video compatibility was the major constraint on the Japanese products. Even the Fuji DS-1P, while a true digital camera, was called a "digital still video camera". Q: With Kodak being a major film manufacturer, was the company reluctant to develop a digital camera system? A: Many people in Kodak were reluctant. Some of top management tried to stop our business, but some wisdom prevailed and they did not succeed. It was clear to us that what we were doing would soon be done by others, and we had better be the leaders if the film business was going to be impacted as we expected it would be. We joked about smuggling the products out of Kodak "under the radar" but the DCS received a lot of publicity, and that was not really possible. Probably the greatest concern was that we were targeting professional photographers, where one converted customer meant a lot of film sales lost. But remember that Kodak had invested a lot of money in electronic imaging development throughout the 1980's and there were several digital camera projects underway when the DCS appeared. It's just that Kodak had no coherent plan at that time to transition from film to digital. And to be fair, there was no way to replace the enormously profitable film business. So the company as a whole was uncertain and didn't invest as much as they could have to insure digital leadership. Electro Optical Camera, the World's first DSLR. Q: Kodak made a few interesting prototypes between the Electro-Optical Camera and the final DCS product. A few of them, like the D-5000 and IRIS, had a memory card slot. How did you end up with the big, bulky Digital Storage Unit? A: We were in a hurry. 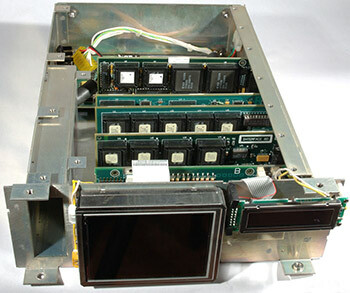 Larry McMillan's team had been working on the IRIS camera, but it was not going to be adequate as a commercial product. It would be a while before memory cards could hold more than a couple of megapixel images. Larry wanted to get a product out ASAP, and my Hawkeye II team had the hardware to do that. We started working together in 1990 and the quickest route we could see to a product was to repackage the Hawkeye II electronics as they were. So the bulky DSU. Nobody thought it was the ideal configuration. We talked about shrinking the DSU. We probably could have made it half the size it was, by dropping the cards-in-backplane idea and just putting what we needed on a couple of circuit boards. But we didn't want to take the time and spend the money until we tested the market more. Q: With a price tag starting around $20,000, the Digital Camera System was extremely expensive compared to traditional film cameras. Who were your customers? Kodak DCS DSLR and Nikon QV-1000C Still Video Camera. Q: Nikon's $20,000 QV-1000C 1988 still video camera was sold at loss, and Nikon management wanted to limit sales to save money. With 987 units sold, did the DCS price cover Kodak's R&D and manufacturing costs? A: We lost a little on the early DCS program, but not much. We had a very lean and efficient development team, so the investment was not that great. By 1994 or 1995, we had recovered all the development costs for the DCS program up to that point and actually ran in the black for a few months! At that point, Kodak management thought we should grow rapidly and be a big revenue stream, and they added a lot of people. After that, the business always ran a small loss. We kept going until 2004 only because the business generated prestige for the consumer digital business, and generated a lot of printing business. Q: Did the camera see any serious, real world use, or was it mostly considered a high-tech novelty and a test bed for better things to come? A: Absolutely serious. Few customers would pay $20K for a novelty. They all had some compelling reason why such an expensive camera would be worth the investment. The fundus camera application was probably a third of DCS sales and that was an application that made a real difference in people's lives. The DCS was not a novelty, but it definitely was a test bed for better things. We learned a lot in the process, and we followed up with a great line of cameras. We all knew the market wasn't excited about shoulder pack cameras, so we moved as quickly as possible to the single handheld unit. The DCS200 was made possible only because 2.5" hard drives had reached enough capacity by 1992. Storage was the limiting factor in those days. Q: Did you use the DCS for any serious photography yourself? Not exactly a camera you'd bring on a family vacation, is it? The DCS kit came in a big, almost impossible to carry flight case. A: No, I didn't. I was still shooting Kodachrome on vacation. The image quality of the DCS couldn't compare to Kodachrome! And I had no need to transmit images, and I didn't even have a computer at home that could handle those images. The DCS was not a convenient camera for personal use! Q: In a historical perspective, how would you describe the original DCS camera? A: When we launched the DCS, a lot of people suddenly realized that digital cameras were real and were going to change photography forever. I gave a pre-launch review of the camera to my Kodak managers - in fact, the only attendees were the 8 managers in my direct reporting line up to CEO Kay Whitmore. At that meeting, Whitmore held an 8x10 print from the DCS and looked at his subordinates and said "This could do something to film, couldn't it?" I really think they didn't expect that would happen so soon. Even though the product was $20K and the images weren't that great, it was clear that the technology would evolve. And outside, Kodak, I think the same impact was felt. Photographers everywhere started to think about life after film. Of course, we had been making megapixel cameras for 4 years already and had sold a few of them. But there was so little publicity that most people thought (many still think) that the DCS was the first commercial DSLR. So it is an icon of the coming change, and an expensive collectable today! Because I had lived with the pre-DCS cameras, I thought the DCS200 was a lot more revolutionary! 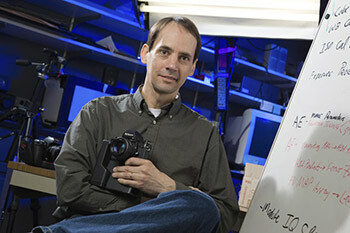 Q: What was your biggest challenges when designing this completely new camera system? A: Well, the DCS was not completely new, since it was a leverage of the Hawkeye electronics. One of the largest single technical challenges was getting that design to meet the FCC interference regulations. The modular design of the HE II was not well planned for minimal radio emissions and we spent a couple of months getting it sealed up enough to pass. I think the largest efforts were all centered on image quality, particularly in the analog circuits around the CCD, and the processing software. The DCS was the first high res color camera and color fidelity was a major challenge throughout the DCS history. Q: A silly and impossible question to answer, perhaps, but in retrospect - considering the knowledge and technology available at the time - is there anything you would have done differently? For example, did you have to make any shortcuts when designing the original DCS? A: As I said before, we would have, we should have made the shoulder pack smaller. We probably could have saved a lot of FCC struggle and made a much more appealing product with a few months of packing the same electronics into a more compact form factor. Perhaps we could have sold twice as many if we had done that. Q: The camera was originally named "Kodak Professional Digital Camera System", or simply Kodak DCS. Today, it's commonly known as DCS 100. What happened? Asking Jim McGarvey, he responds: "I think it probably is the source. I have a photocopy of this article, and it's the first article I have that uses the "100" moniker, though I had not noticed that before you pointed it out! It's probably the first publication of the DCS200 news, since it's before the Mac World announcement and we did not announce much before that show. I remember John Durniak's name - he must have been close to Kodak. I see that he died in 1997, so we may never know for sure." A: The "100" was applied by a magazine writer when we announced the DCS200. I don't remember who it was, but it did not originate in Kodak. In hindsight, we should have given the first one a number, but we just didn't think about what would happen when the next one came out. It wasn't long before we all started referring to the DCS100 at Kodak, but it was never used in any official way. Q: Any interesting anecdotes you could share? A: After we had sold maybe 500 of the DCS(100) cameras, the sales rate dropped off and we assumed we had saturated the market for such an expensive camera. After a few months of trickling sales, the accountants decided we should quit and write off the remaining inventory of parts. We had made circuit boards and packaging for another 300-400 cameras, but they were not assembled yet. So they crushed all that material in order to take the loss on taxes. Not long after that, we received an order for something like 300 cameras from one customer, to use for opthalmic retina imaging. They had purchased a camera early on for evaluation, but we didn't keep track of their interest. So, we started up the production line and replaced all those parts we destroyed! 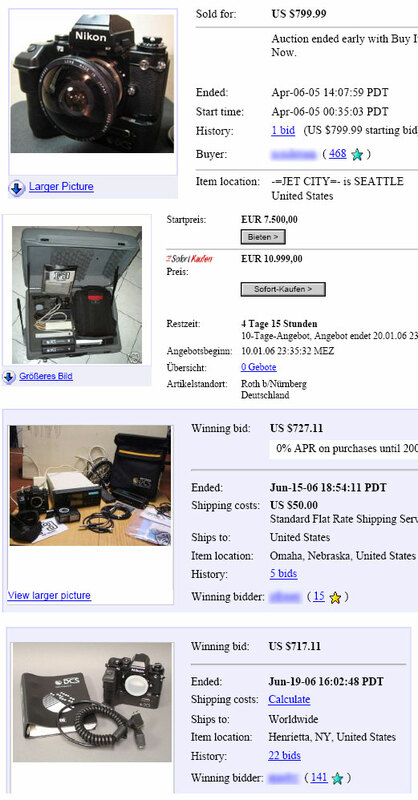 In case you were wondering: The German DCS kit starting at 7500 euro did not sell. NikonWeb.com forum - Kodak DSU: How to replace internal battery?